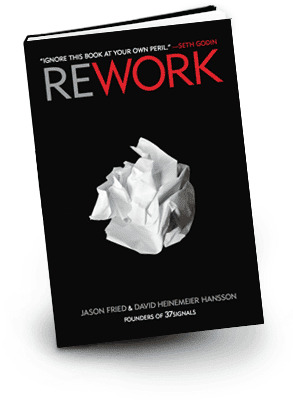 I just finished reading Rework by the 37 Signals team (Jason Fried and David Heinemeier Hansson), a Christmas gift from my youngest son. If you are not familiar with 37signals and their work I recommend checking them out. The book provides an outline of the 37signals philosophy including tips and opinion. It is aimed at small businesses, however, I think everyone from small business to large business to government organizations should read this book and think about how it might be applied to their work. They don't say this explicitly but what the book is really about is rethinking some of the dogma of business-as-usual. I have often thought that any organization that has an "innovation" branch is already in trouble. If you read this book you'll find out why. An innovative culture isn't something you can install, or force directly. Innovative cultures happen by consistently rewarding innovation. Sharing cultures happen by consistently rewarding sharing. Organizations that consistently treat employees as untrustworthy, end up with a culture of fear and lack of trust. For examples of how to do it right in a government context, I think the Province of BC is on the right track with their new B.C. Government Social Media Guidelines and their public statement of Open Data as Defining Principle No. 1 of their Citizens @ the Centre: B.C. Government 2.0 strategy. The very fact that these documents exist sends a signal to employees of a relatively large organization that they are trusted and empowered to engage citizens and empower citizens to create value from open government data. This kind of positive reinforcement will go a long way to creating a culture of learning and trust as people come up to speed with the new tools of social media and open data. Kudos to the folks that made this happen and the executives that supported them. I look forward to seeing what they do next. Creating an environment where innovation happens, where sharing is rewarded, where great work is recognized and where trust is leveraged is the hallmark of an organization that gets it. 37signals definitely gets it. Rework is an easy and worthwhile read. If you're interested in innovation in the workplace, I recommend you read it.